Sgt. 1st Class Brett E. Walden was killed in action on August 5, 2005 near Rabi’ah, Iraq, while serving with ODA 535, C Company, 1st Battalion, 5th Special Forces Group (Airborne). 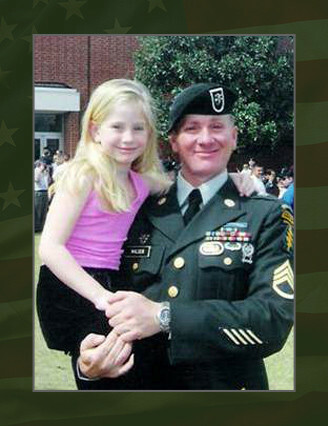 Walden, 40, was a Special Forces weapons sergeant assigned to ODA 535, C Company, 1st Battalion, 5th Special Forces Group (Airborne), Fort Campbell, Ky. Walden, of Fort Walton Beach, Fla. enlisted as an infantryman in February 1987. He served as an infantryman in Hawaii from 1987 to 1992. He then served with 2nd Brigade, 327th Infantry Regiment at Fort Campbell, Ky. until 1997. After a year with 1st Brigade, 505th Infantry Regiment, Fort Bragg, N.C., Walden attended the Special Forces Qualification Course, graduating in October 2000. He arrived at Fort Campbell November 20, 2000 and was assigned as a weapons sergeant with C Co, 1/5th SFG (A). While serving with C Co, 1/5th SFG (A), he spent one tour of duty in Afghanistan in support of Operation Enduring Freedom (OEF) and had recently begun his fourth tour of duty in Iraq in support of Operation Iraqi Freedom (OIF). Walden’s schools include the Basic Airborne Course, the Air Assault Course, the Ranger Course, the Primary Leadership Development Course, the Basic Noncommissioned Officer’s Course, the Combat Lifesaver Course, Special Forces Qualification Course, the Russian Language Course, the Survival, Evasion, Resistance and Escape Course, the Military Free Fall Course and the Advanced Noncommissioned Officer’s Course. His awards and decorations include the Bronze Star Medal, the Army Commendation Medal with 1 oak leaf cluster, the Army Achievement Medal with 3 oak leaf clusters, the Army Good Conduct Medal with 5 bronze loops, the National Defense Service Medal with bronze service star, the Armed Forces Service Medal, the Noncommissioned Officer Professional Development Ribbon (3), the Army Service Ribbon, the Overseas Service Medal, the Global War on Terrorism Service Medal, the Global War on Terrorism Expeditionary Medal, the Afghanistan Campaign Medal, the Iraq Campaign Medal, the Combat Infantryman Badge, the Expert Infantryman Badge, the Parachutist Badge, the Military Freefall Badge, the Air Assault Badge, the Ranger Tab and the Special Forces Tab. His posthumous awards include the Bronze Star, the Purple Heart, and the Meritorious Service Medal. He is survived by his wife, Autumn and daughter, Alexandria both of Dover, Pa.